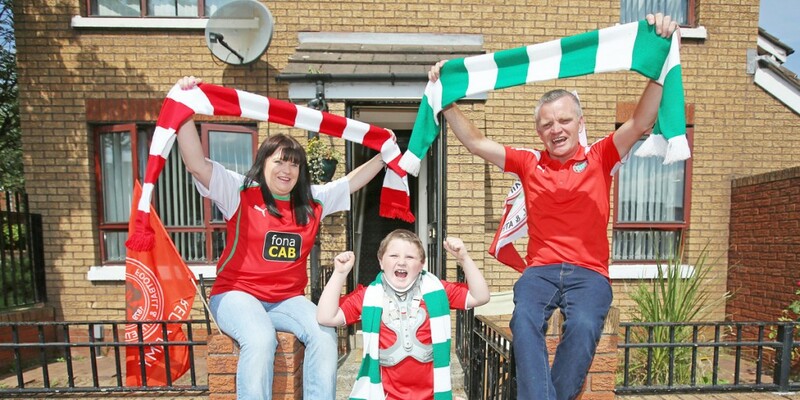 A nine-year-old boy who suffered life-threatening injuries in January after he was struck by a car on the Grosvenor Road was guest of honour at the Champions League clash between Cliftonville and Celtic last night. In a miraculous recovery that amazed doctors at the Royal Victoria Hospital for Sick Children, Joseph McDermott attended the match with his mother Joanne and grandfather Simon Smith. Speaking from their Grovetree North home, which was bedecked in the colours of both famous old clubs, Joanne told the Andersonstown News that doctors have called Joseph “a miracle”. “In January we were keeping a constant bedside vigil at Joseph’s bed and we were hoping the specialist ‘Halo’ neck brace which had to be drilled into his skull was going to aid his recovery,” she said. “He had fractured the back of his skull, he had some bleeding around his brain, a break in his neck, swollen shoulders and had pins put in his arms. He had broken ribs, a break in his pelvis and a broken ankle. “A number of scans were sent to London’s Great Ormond Street Hospital and even as far as America which had staff baffled at ‘this miracle’. It was around May that doctors decided to take the Halo brace off He was fitted with a moulded brace to support his neck which has made him a lot more comfortable but his progress will be monitored by medical staff. “This match is going to be something we can all share in together,” said Joanne. “I cherish things so much now, even the little things like a trip to the cinema. Joseph has become so much more outgoing since coming out of hospital, he is always happy. He is my miracle.